Fresh unique WordPress Themes for Creative Portfolio, Businesses and Personal website. Highly customizable, simple, feature rich, SEO friendly, fast loading, functional and modern WordPress themes will make your web design look more impressive and attractive to visitors. The powerful Theme Options Panel paired with intuitive page options panels, a widgetable areas manager and a custom tailored Visual Composer, drag and drop page builder, provide you the tools you need to create complex websites without touching a line of code. 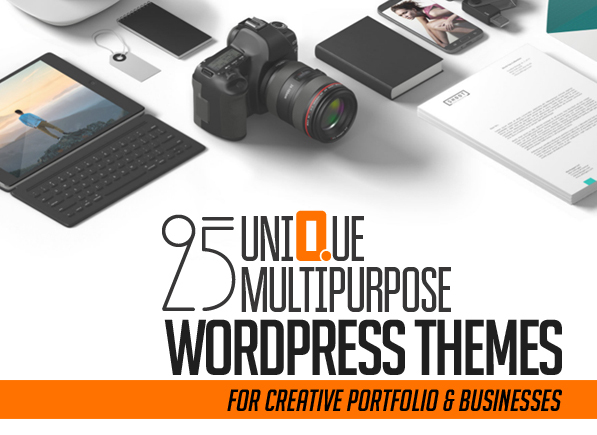 These 2017 WP themes are the best choice for you to create a business, creative agency or personal portfolio, photography or a blogging website. Premium WordPress Themes are Perfect for any Entrepreneurs, Blog, Magazine or any Business Website. Create any page using the Visual Page Builder and Addon’s and a lot of interesting things. Below every theme is ready to use, you can check live demo of each theme. Craftit is a professional WooCommerce shopping theme for WordPress built with Bootstrap and powered by Unyson framework. The theme is suitable for any kind of shop raging from clothes to electronics thanks to it’s minimalist design and custom modules specially created for easy content creation. Pixlr is a Premium, Beautiful, Creative and Responsive Multipurpose One Page WordPress. Building amazing Landing Pages in the Categories like App Showcase, Portfolio, Agency, Home Movers, Restaurant, Learning, Conference, Photographer etc is super simple and fun with this Template. Cephenus is a Photography WordPress theme which is focused on freelancer, photographer, architects, artists and many more individual who want to showcase his/her work. It is mobile responsive theme based on bootstrap framework, your site will looks great on any modern mobile device. COSMOS is a creative & unique Multipurpose App Landing Page WordPress Theme for App Showcase & AppStore. You can use it as An Application Exhibition, Landing Page and Appstore. The Theme is proudly featured on behance community for its interaction. CUMAN is a Creative & Multipurpose WordPress Theme. It suits any corporate or business website. The theme well organized and very easy to costumize. Envas is a responsive Mulitpurpose theme, best suitable for corporate, finance, consultancy or other similar business. Envas will help you to make any website like corporate, financial, professional, agency or other business very easily. Eight is a unique and flexible multipurpose WordPress theme suitable for a wide variety of businesses. This theme offers many various possibilities which will help you easily create a beautiful and stunning website. Eight is applicable for corporate websites, personal blogs, product-oriented sites and many other various site types! Leonado – Multi-Concepts WooCommerce WordPress Theme comes with modern and unique designs specially made for online stores crafting. This adorable theme gets a perfect fit for various types of shopping online such as Clothing, Shoes, Jewelry, Watch, and more. Rettic is a Modern, Unique and Multipurpose One-Page Business WordPress Theme for Creatives which suits any Corporate, Design Agency or freelancers portfolio websites. Oblak – One Page Portfolio WordPress Theme is a responsive, clean and modern designed landing page theme. Lila One Page Parallax Responsive WordPress theme suitable for any creative business agency , It’s a fully responsive, compatible with all modern mobile devices. a perfect theme for Business Startups,resume, personal, web studio and creative agencies. PowerNode – Multi-Purpose Landing Page WordPress theme it’s an advanced, and powerful premium WordPress theme suited for personal onepage/singlepage websites/blogs, business websites, users who want a very nice portfolio website where they can showcase their work, or for any other purpose website. It’s fully responsive, flexible, clean, with a professional design, Search Engine Optimized and comes with an advanced framework with tons of powerful and flexible theme options in order to make your life easier and build your site very quickly. RxApps – Responsive WordPress App Landing Page is a perfect WordPress landing page to showcase your app. It is fully responsive, so you have the power to make your new landing page look awesome on all types of devices. VG Guso is a flexible WordPress theme with a clean and fully responsive design, based on Bootstrap 3 and Redux Framework. Perfect for any kind of boutique, clothes store, fashion shop, etc. and is fully compatible with WooCommerce. Mint is a multi-purpose, clean, creative, fully responsive and powerful WordPress Theme. Our theme has included multiple header layouts, Revolution Slider plugin, drag & drop visual page builder (Visual Composer), powerful theme options panel, video backgrounds, parallax, many elements, 600+ Google Font and more. BizOne One Page Parallax Theme, suitable for any creative or business startups. Multiple home layouts and Navigation styles are included in this theme with lots of CSS and JQuery animations, a perfect theme for Business Startups, web studio and creative agencies. The colorful widgets will help anyone to customize according to their branding colors. ThePhantom – Multipurpose WordPress Theme is a clean and elegant design – suitable for agency, blog, business, company, corporate, creative, portfolio, professional etc . It has a fully responsive width adjusts automatically to any screen size or resolution. Etro is a good idea for you to build a website about Home Services like Maintenance, Repair and Improvements such electrical services, plumbing, painting, door repair, appliance, bathroom repair, drywall or interior maintenance. This powerful theme is packed with lots of pre-designed pages, awesome layouts and amazing styles and 22+ premade elements helping you display your stores impressively and professionally. Bridal – Wedding WordPress Theme + RSVP, Event Planner, Ceremony, Gallery, Shop is the perfect WP template for Couples, Wedding, Photographer,… Website. A clean, modern, responsive design will make your content shine. Fast, un-bloated and coded to the highest standards with your website, you can focus on content creation and the theme will do the rest.